(Nanowerk News) When light is absorbed by atoms, the electrons become excited. If the light particles, so-called photons, carry sufficient energy, the electrons can be ejected from the atom. This effect is known as photoemission and was explained by Einstein more than hundred years ago. Until now, it has been assumed that the electron start moving out of the atom immediately after the impact of the photon. This point in time can be detected and has so far been considered as coincident with the arrival time of the light pulse, i.e. with "time zero" in the interaction of light with matter. 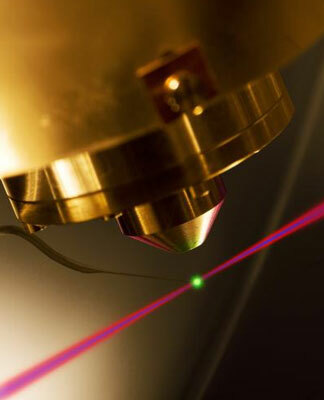 Using their ultra-short time measurement technology, physicists from the Laboratory for Attosecond Physics at the Max Planck Institute of Quantum Optics (MPQ), the Technische Universitaet Muenchen (TUM) and the Ludwig-Maximilians-Universitaet Munich (LMU) along with collaborators from Austria, Greece, and Saudi Arabia, have now tested this assumption. The physicists fired pulses of near-infrared laser light lasting less than four femtoseconds (10-15 seconds) at atoms of the noble gas neon. The atoms were simultaneously hit by extreme ultraviolet pulses with a duration of 180 attoseconds, liberating electrons from their atomic orbitals. The attosecond flashes ejected electrons either from the outer 2p-orbitals or from the inner 2s-orbitals of the atom. With the controlled field of the synchronised laser pulse serving as an "attosecond chronograph", the physicists then recorded when the excited electrons left the atom. The photoemission of electrons by an attosecond light pulse (blue beam) is time resolved by controlling the electron motion with an ultrashort visible laser pulse (shown as red beam). This attosecond streaking uncovers that electrons from different atomic orbitals are released with a delay comparable to the atomic unit of time. Their measurements revealed that electrons from different atomic orbitals, although excited simultaneously, leave the atom with a small but measurable time delay of about twenty attoseconds. "One attosecond is one billionth of one billionth of a second, an unimaginable short interval of time. But after excitation by light one of the electrons leaves the atom earlier than the other. Hence we were able to show that electrons "hesitate" briefly before they leave an atom," explains Reinhard Kienberger, Professor for Experimental Physics (E 11) at the TUM and head of the Junior Research Group Attosecond Dynamics at the MPQ. Determining the cause of this hesitation was also a challenge to the LAP theorists around Dr. Vladislav Yakovlev and his colleagues from the Vienna University of Technology (Austria) and the National Hellenic Research Foundation (Greece). Although they could confirm the effect qualitatively using complicated computations, they came up with a time offset of only five attoseconds. The cause of this discrepancy may lie in the complexity of the neon atom, which consists, in addition to the nucleus, of ten electrons. "The computational effort required to model such a many-electron system exceeds the computational capacity of today's supercomputers," explains Yakovlev. Nevertheless, these investigations already point toward a probable cause of the "hesitation" of the electrons: the electrons interact not only with their atomic nucleus, but they are also influenced by one another. "This electron-electron interaction may then mean that it takes a short while before an electron that is shaken by the incident light wave is released by its fellow electrons and allowed to leave the atom," sais Dr. Martin Schulze, Postdoc at the LAP-Team. "These to-date poorly understood interactions have a fundamental influence on electron movements in tiniest dimensions, which determine the course of all biological and chemical processes, not to mention the speed of microprocessors, which lie at the heart of computers", explains Ferenc Krausz. "Our investigations shed light on the electrons' interactions with one another on atomic scale". To this end, the fastest measuring technique in the world is just about good enough: the observed 20-attosecond time offset in the ejection times of electrons is the shortest time interval that has ever been directly measured.